The United States has a long history of immigrant military service. 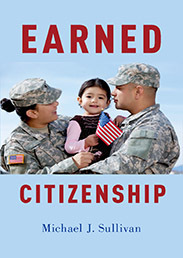 Immigrants who serve in the armed forces during declared hostilities, including the period after 11 September 2001, are eligible for expedited naturalization. However, those who naturalized through military service since 24 November 2003 are vulnerable to potential revocation of their US citizenship. This presents unique and unacceptable risks for non-citizens who volunteer to serve in the United States military beyond the already grave dangers that all service members agree to bear. Immigrant military personnel are in need of the protection of the United States beginning when they take an oath to “defend the Constitution of the United States against all enemies, foreign and domestic” and to “bear true faith and allegiance to the same” as part of the enlistment process. Despite the risks that come with swearing allegiance to the US and serving in its military, non-citizen enlisted personnel are not assured of US citizenship. Those who assume the risks of volunteering for foreign military service deserve protection by the state that is recruiting them. Once immigrant military personnel pass security checks, swear allegiance to the United States as part of their oath of enlistment, and begin to serve in their adopted nation’s defense, they should receive unconditional naturalization for both their loyalty and service. Currently, conditional naturalization does not adequately protect immigrant military personnel who face possible revocation of citizenship in their country of origin if they naturalize elsewhere. Most naturalized citizens who lose their nationality of origin by naturalizing elsewhere are in minimal danger of losing their newly acquired US citizenship, unless they commit fraud during the process. Armed forces personnel who naturalize through one of the military naturalization statutes can also lose their citizenship if they receive an other than honorable discharge from the military for any reason during their first five years of service. Immigrant military personnel should not be prone to denaturalization after they have served in their adopted country’s defense. Nor should they be without protection from subsequent vulnerabilities to deportation and statelessness. Immigrants who earn their naturalization through military service are at once exemplary and vulnerable citizens. They are commended by other citizens for their service but uniquely prone to denaturalization. Here, the danger comes from state actions that are overly responsive to fears about immigrant loyalties. In an all-volunteer army, everyone who enlists takes on risks and obligations not shared by their fellow citizens, who rely upon them for their nation’s defense. By asking the United States not to deport or denaturalize them, immigrant military personnel are invoking a basic moral claim to citizenship as reciprocity. In the process, immigrant military personnel are invoking traditional questions of political obligation in new ways. They are not asking for a justification for why they should be required to serve their adopted country and potentially sacrifice their lives in its defense. This question is more relevant to states that still conscript their civilian residents to serve involuntarily in their militaries. In an all-volunteer military, both immigrant and citizen military personnel and veterans willingly agree to take on demanding civic obligations. The question here is not what they owe the state, but what the state and its citizens owe military personnel and veterans in return for their loyalty and service. Based on their allegiance, service, and the risks they incur on behalf of their adopted country, the US government and its citizens bear primary moral responsibility for the welfare of their personnel. Those who enlist in the US military as non-citizens may be required to go to war with their country of national origin. As a safeguard against any repercussions they may face from their country of origin, and as a reward for voluntary service that extends beyond what is required of civilian US citizens, immigrant military personnel need and deserve the protection of irrevocable US citizenship. Featured image credit: POM/DLIFLC Memorial Day Ceremony 2017 by Presidio of Monterey. Public Domain via Flickr.